This unusual depiction of the Christmas Nativity scene may be found in an illustrated Bible held in the Chapter Library (RBK B.210). Published in Lyon, France, in 1527 by Jacques Mareschal, this Latin version of the Bible (traditionally known as the Vulgate) contains a number of woodcut pictures by Hans Springinklee of Nuremberg, a former pupil of the famous German artist and engraver, Albrecht Durer. 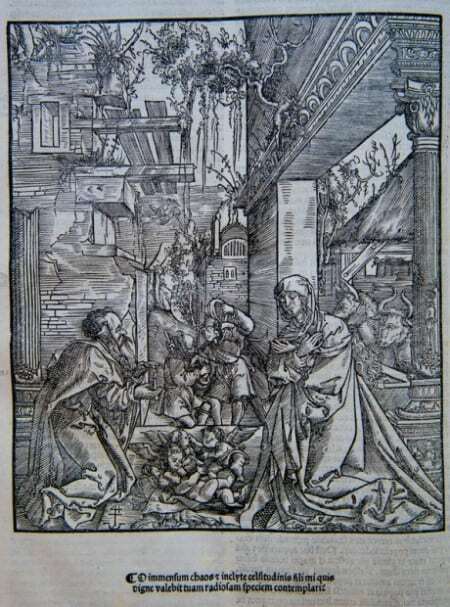 Springinklee’s Nativity engraving had first appeared several years earlier, in 1517, in a devotional prayer book known as Hortulus animae [The garden of the soul] which had been published in Lyon by Jean Clein at the expense of Johann Koberger. Its first use as a Bible illustration was in a Latin Vulgate printed in Lyon in 1519 by Jacques Sacon for Anton Koberger. It was subsequently included in Bibles published in Lyon by J Marion, between 1520 and 1523; by Jacques Mareschal, between 1523 and 1527; and by Jean Crespin, in 1527, 1529 and 1540. In 1532, it was to be used by Lyon music printer, Jacques Moderne, to illustrate his Liber Decem Missarum. By 1527, when the Dean and Canons’ version of the Bible was printed by Mareschal, the woodcut must have been familiar with the Bible-reading population of Lyon. The Nativity scene executed by Springinklee shows clear evidence of Northern Renaissance style. It shows Mary, Joseph and the baby Jesus in the ruins of a classical building instead of the traditional stable, a device that entered Netherlandish Nativity paintings sometime in the fifteenth century. The symbolism of the ruins represents the dilapidated state of the Old Covenant before the arrival of the Saviour who will introduce the New Covenant. The caption printed underneath the 1527 version – O immensum chaos & inclyte celsitudinis fili mi quis digne valebit tuam radiosam speciem contemplari – contrasts the chaos of the past with the holiness and worthiness of the Son of God. The radiance of his appearance will soon outshine the dim light of the candle that Joseph holds in his hand, as he kneels in adoration before the infant who will become the Light of the World. There are some curious aspects to the scene – the baby Jesus is hardly distinguishable from the cherubs who are surrounding and interacting with him; the figures in the middle background, presumably shepherds, are locked together in a strange pose; and the vernacular building in the distance seems to be intact and well maintained in contrast to the classical ruins in the foreground. The central composition, with the unclothed infant Jesus lying on the ground with Mary and Joseph kneeling before him in adoration, is one common to many Renaissance Nativity scenes. It is the quality of the woodcut and its dramatic setting which make Springinklee’s Nativity so memorable.